Of all the vehicle maintenance that we do, there’s no service more important to a vehicle’s long-term health than routine oil changes. We are one of the best auto maintenance providers in Medford and the surrounding areas, and our staff is able to conduct oil changes in an efficient, timely, and friendly manner. Oil helps make sure that everything in your engine is able to function, smoothly. Without oil to lubricate the engine, parts get jammed and broken. Oil begins to break down, over time, though. This makes it unable to do its job in protecting your engine, and increases the chances of expensive, and potentially car-totalling, damage from occurring. Getting oil changes on a recommended timeline improves the health of your vehicle, and makes it more likely to last much, much longer. 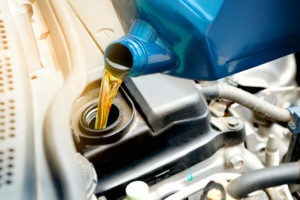 The amount of time that should go between oil changes is dependent on mileage, and your particular vehicle type. Typically, most vehicle manufacturers recommend getting an oil change between 3,000 to 5,000 miles. However, you should look at your owner’s manual to find out exactly how often you should be taking your vehicle in for a change. Remove Old Oil: The molecules of oil breaks down over time, as it gets used in the engine. For this reason, it’s important to empty the old oil out of the engine. Adding New Oil: Each vehicle has different recommendations on what kind of oil is needed for specific temperatures. After emptying the old oil, auto maintenance technicians will replace it with fresh oil. Replacing Oil Filter: The other major component that deals with oil in your engine is the oil filter. An oil filter keeps the oil in an engine clean from dirt, grime, and other things that it collected in a cycle through the engine. Come in for an Oil Change, Today! If you are in need of an oil change in Medford or the surrounding area, don’t hesitate to call Schulz Garage to get honest estimates, superior customer service, and incredibly fair pricing.